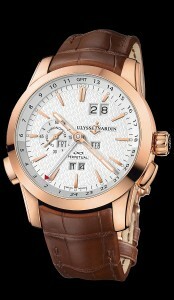 Rose gold, 43mm case, textured silver color dial, day, date, month, year, and Dual Time GMT function. All in-house Ulysse Nardin automatic movement, sapphire exhibition case back. It is available on elegant crocodile leather strap, with rose gold folding buckle.